Panda Nebulizer, BUY Panda Compressor, Nebulizer Compressor, MQ6005. Penelope Panda Pediatric Compressor Nebulizer Systems, manufactured by Medquip, are pediatric compressor nebulizers. These pediatric nebulizers feature a child friendly design. 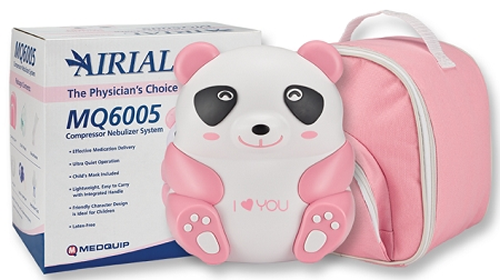 This panda shaped nebulizer comes in a light pink carrying bag that is perfect for little girls. 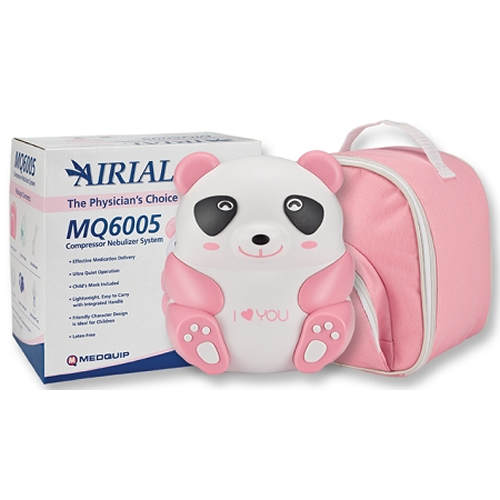 Child friendly designs, like the panda, help to reduce the stress children feel when taking aerosol medications. These child friendly Compressors are easy to use and come complete with a mouthpiece and an administration set. These piston compressors are so durable that the manufacturer extends a limited lifetime warranty. For every order, the manufacturer will donate a portion of the proceeds to breast cancer research. I have had this nebulizer for my now 6 year old daughter since shortly after she was diagnosed with RSV at 3 weeks of age. I have had no problems with it whatsoever. My daughter can now assemble and use the nebulizer herself. It is very easy to use and she is so proud of her independence!